With a stay at Hotel Figueroa Downtown Los Angeles, you'll be centrally located in Los Angeles, steps from Grammy Museum and minutes from Microsoft Theater. 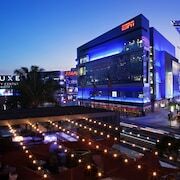 This 4-star hotel is within close proximity of L.A. Live and Staples Center. Make yourself at home in one of the 268 air-conditioned rooms featuring minibars and flat-screen televisions. Rooms have private balconies. Cable television is provided for your entertainment. Bathrooms have bathtubs or showers and complimentary toiletries. Don't miss out on recreational opportunities including an outdoor pool and a fitness center. This hotel also features complimentary wireless Internet access, concierge services, and a fireplace in the lobby. Guests can get around on the complimentary shuttle, which operates within 2 mi. Grab a bite at one of the hotel's 2 restaurants, or stay in and take advantage of 24-hour room service. Thirsty? Quench your thirst at one of the 4 bars/lounges or 2 poolside bars.